Our city has a lot of great runs this weekend. The Back On My Feet Philly 5 Miler, Phillies 5K, Manayunk Fools Run, The Love Run Half Marathon and so much more! And let’s face it, the weather lately has been very Philly like. The week started with rain, then turned to high 60’s on Thursday and now this weekend it looks like Spring is going into hiding. According to AccuWeather Saturday morning, just in time for the Back On My Feet 5 Miler and Phillies 5K, should be in the mid 20’s. Along with this is a chance of flurries. That’s right, that four letter word we’ve seen enough of: snow! Our advice, dress in layers. The start of these runs may be pretty cold, but by the time they are over it could be warming up. A jacket you can tie around your waist after the first few miles wouldn’t be bad. Additionally, local weather legend Cecily Tynan is reporting this fun news on twitter. Saturday is shaping up to be the rougher morning as far as cold weather is concerned. Dress properly for whatever run you may be doing. 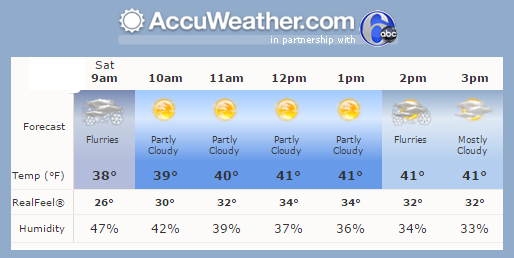 Sunday looks a little better for the Love Run Half Marathon. 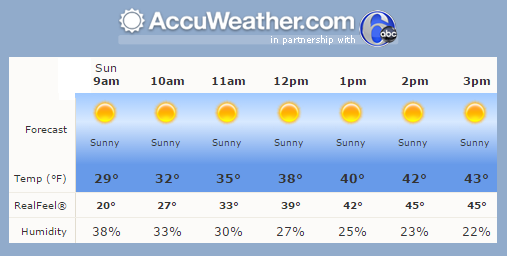 It looks like the day will start in the low to mid 20’s and warm up to the 30’s after you’ve run the first 4 miles or so. The better thing about Sunday is no chance of snow.